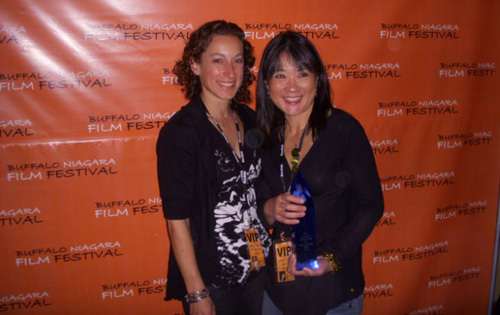 The Buffalo Niagara Film Festival closed out its fourth annual entry, ending a pretty great eight days of cinema. Attendance might have been stunted due to a plethora of activities in Buffalo, including a Salman Rushdie talk that prevented me from going to opening night and the brief return of Sabres hockey to the playoffs, but that did little to dampen the spirits of organizers, volunteers, or filmmakers. What makes this event uniquely great in comparison to an event like the Toronto International Film Festival is that you don’t have the big name movies coming through, luring you away from the lesser-seen fare where a festival visit could be your only chance to watch. Rather than dismissing an indie feature you’ve heard nothing about in order to check the new Coen Brothers flick that will be coming to a theatre near you in two weeks, you are completely open to seeing work from up-and-comers, art created by a writer and/or director’s own blood, sweat, and tears. Checking the website online got me into the mindset that some high-profile stars would be coming around for a visit, but unfortunately none panned out for the shows I was able to make. The special guests that did make an appearance, though, trumped any A to B-list actor that could have come—they were the passionate and creative people behind the films which were strung together on a shoe-string budget and for the simple goal of making something personal and resonate. It is one thing to partake in the obligatory clapping for the hard work put into each film once the end credits roll, but a completely different beast when the people you’re cheering are actually in attendance, letting the praise soak in. I would have liked more to get up afterwards and say a few words, perhaps involving the audience in an informal Q&A like some, but I’ll take what I can. The unfortunate negative of attending for reviewing purposes—don’t get me wrong, I love watching movies and would probably opt to see more than leave the theatre for a party anyway—is that I had to miss out on the get-togethers across the street as the Bijou Grille. I’m sure chilling with the talented filmmakers would have been a great time. Instead, however, I was able to catch twelve features and nine short films during the week run of the festival, by far trumping the previous high of last year’s three full lengths. Allowing for more movies to be shown after 5:00 was the main reasoning for such an increase, giving me no excuse why I couldn’t hop on the 33 to make it for an evening of cinema after the day job’s whistle blew. Heck, I even used Game Two of the Sabres/Bruins series as a reason to see more films. Saturday the 17th was originally going to solewly consist of me watching Yuri Tsapayev’s Contractor’s Routine and possibly attending his after party following, but being downtown for a 1:00 puck drop meant a short ride down Main would bring me to the Market Arcade in time to see most of a Short Film block, as well as the local political comedy Bravo Sierra. Thankful of this happy coincidence, I was able to experience a couple fantastic mini-movies, including a wonderful senior project, St. Gertrude, by Emily Johnson at SCAD—she’s a graduate of my old high school Ken East, so singling out is warranted. And Bravo Sierra, well let’s just say it was an uproarious good time with a pretty packed theatre relative to the other screenings, all having a good time seeing what would soon win Best WNY Film at the award ceremony during closing night. The rest of my visits saw a couple comedies, a sci-fi faux documentary in Lunopolis that really took me by surprise, a local horror entry in *Cemetery, a throwback 70s car chase thriller in RAGE, and even a pretty informative documentary about the topical debate on vaccine usage with Autism: Made in the U.S.A. For the most part, each film, whether great or just okay, had some redeemable quality to show the talent of those behind their creations. All the local stuff brought with them friends and family to experience the debut on the big screen while others looking for added exposure and press played small but infectious crowds of film-lovers. I do think that a festival like this is more valuable than just the show of audience members, though, because it is a screening to put on the movie’s resume, an opportunity for fans to tell their friends to check something out when it hopefully gets distribution somewhere, and a vehicle to gain some internet buzz that may help spread the word further. In that respect, I do hope my reviews can serve a purpose and be used to push the work and open doors for future endeavors. And that is the most enjoyable part, for me, of going to this festival each year—meeting filmmakers that are confident in their work and willing to go the extra distance to gain an audience and achieve success. Last year connected me to a talented director named Jeff Orgill with his comedic gem Boppin’ at the Glue Factory, making its way to Netflix soon. Seeing more movies in 2010 meant the possibility of more connections made through the world of Facebook and Twitter. Some were from those unable to attend that saw the reviews—one of which, Jerry Cavallaro, filmed an intro specifically for those at his film Stuck Like Chuck and is perhaps the most tenacious promoter ever as he looks to fund a sequel to film in November—and others who made it in for their screening and the festivities going on in conjunction with the festival. Not only was it great to see David Crabtree and his cast and crew come in to answer questions post-screening of Broken Dreams, but also that they stayed and attended screenings the rest of the week, making new friends and supporting others showing their work. Connecting with Lisa Ford, director of The Teacher, and Jay Pulk, of Copper Penny, was also a bonus—the latter a film I was unable to catch but hopefully will be able to in the future. 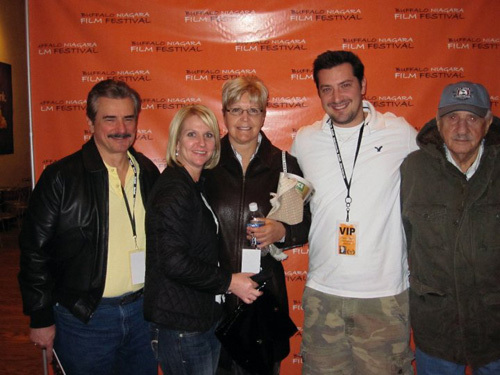 Elias Plagianos and star Joshua Burrow of The Crimson Mask all made it into Buffalo for their screening, as did the Sandra Feldman of A Touch of Grey, both films solid work worthy of checking out. I won’t lie that it wouldn’t have been cool to see the trio of cast members from closing film Christina, but unfortunately they couldn’t make it as Stephen Lang was busy filming Conan in Bulgaria and Nicki Aycox shooting her show “Dark Blue”. Director Larry Brand and producers were in attendance, though, and luckily too since the film went on to win Best Director, Actor, Actress, and Film a short hour later. Shot with low light, Christina did show one limitation to the Fest being the second venue, the Riviera Theatre and its lack of a strong projector or pitch-black room of the historic building. I overheard Brand himself saying it was way too dark, but being such a character driven work, the film itself wasn’t hurt by the display. I do wish I could have seen more films, but you can’t fault the festival for including so many that some days made you choose by having two screens going simultaneously. It is great to see that interest continues to grow and along with it the quality of work too. Thankfully some filmmakers, like Greg Kaplan, are kind enough to send me a copy of their film for review, (I’m Not Here (and she’s not there)), a job that I am more than willing to take part in not only to give a written piece that may hopefully promote the work, but also because I’ll take any opportunity to see a movie I missed during the Festival’s initial run. All the work seen was deserving of its place on the schedule, a couple—Contractor’s Routine and Christina—making their way onto my top ten of 2010 now having completed a third of the year. And, if nothing else, I gained a new bank of names to keep tabs on, social media site friends to stay in contact with, and memories of some great cinema that, without Bill Cowell and his staff’s efforts, I never would have had the opportunity to see, let alone know about. Perhaps some of the short films may make their way onto a future issue of Wholphin, allowing me a second viewing, and perhaps the creatives behind each will hit it big the next time out. 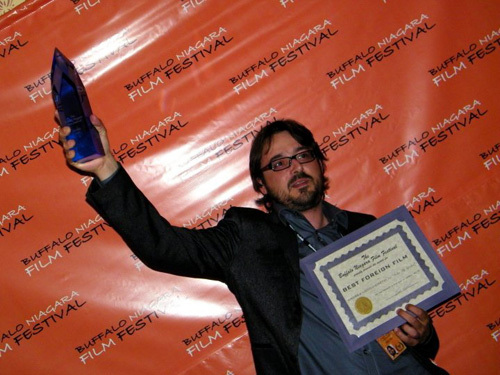 Thanks to the Buffalo Niagara Film Festival, I’ll be able to say I new it all along, ever since I saw one of their early films years ago. Contractor’s Routine red carpet shot courtesy of the film’s Facebook page. Bravo Sierra red carpet shot courtesy of the film’s Facebook page. Andrea Lodovichetti courtesy of Canine Instinct’s Facebook page. A Touch of Grey red carpet shot courtesy of the film’s Facebook page.